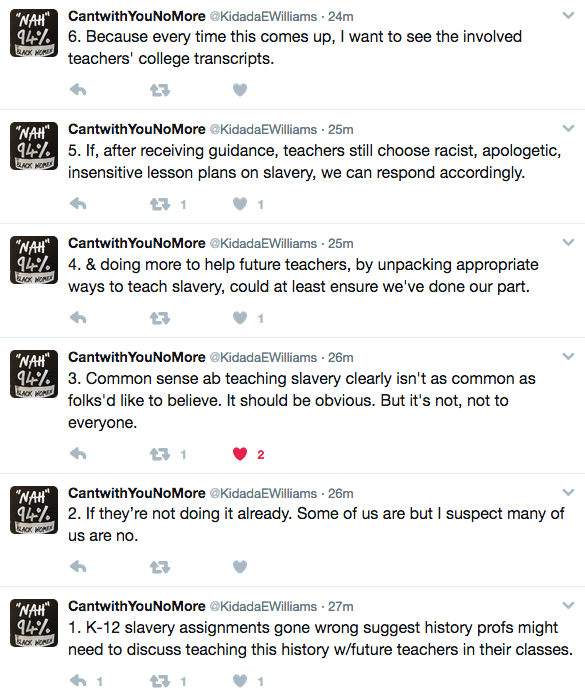 This morning I came across a wonderful series of tweets from historian Kidada Williams, who was responding to recent controversies involving k-12 teachers and lesson plans about slavery that go very wrong. We’ve all seen these reports. Teachers with the best of intentions set up mock slave auctions or place their African-American students in other compromising positions. Examples can be found here, here, and here. Williams rightly calls for increased focus on the history of slavery on the college level and points to the need to help teachers think through appropriate lesson plans on the subject. Again, I completely agree with Williams. Regardless of the grade level history teachers need to be as well versed in recent scholarship on slavery as possible. The public’s understanding of slavery is still defined by numerous myths and distortion. Lesson plans rooted in sound scholarship can go far in avoiding many of these unfortunate outcomes in the classroom, but there is another reason that needs to be acknowledged. Educators need to appreciate that they cannot expect to be able to teach the history of slavery as a passive subject disconnected from the messiness and confusion of historical memory. How a student (and by extension his/her parents) and the broader communities in which they live respond to even the best prepared lesson plan will likely be shaped by a host of factors related to the long and complicated legacy of slavery. History teachers who come into contact with parents, school administrators and even the general public over their curriculum ought to be prepared to defend their area of expertise. They need to be able to demonstrate how their lesson plans engage their students to better understand this difficult subject matter, but they also need to be able to assuage and/or respond to those concerns that move the conversation beyond history entirely. History educators need professional development opportunities that focus specifically on the teaching of slavery. These workshops ought to both deepen the content knowledge of the teacher and assist them in the development of lesson plans that maximize opportunities for student engagement and understanding. Finally, workshops ought to prepare teachers for those uncomfortable moments in the classroom when the past meets the present. How does what Williamsburg offers as teaching units hold up? What about Gilder Lehrman? I am pleased to see a discussion of this–I worked for years with teachers who simply skipped what was uncomfortable for them to teach. We live in interesting times. I am not familiar with CW’s teaching materials. Gilder-Lehrman does a fabulous job. I have used their primary source materials and I have tended to tweak their online lesson plans to better meed my specific pedagogical goals. I know plenty of teachers, especially those in the public school system, who avoid controversial topics. They work under immense pressures, but as I suggest in the post there are ways to deal with these challenges. We need to give teachers the right tools. Look into the CW lessons. I was in their teacher academy one summer several years ago, and found it to be wonderfully inspiring. When I came back to teach 5th grade, we were told that History needed to take a back seat to other topics so we could do well on state tests. My broken heart and I transferred to middle school math. I’m curious as to what she means by “apologetic.” I assume she means “apology” as a synonym for defense of, rather than remorse for (as in, “Christian apologetics”). Is she saying that curriculum is too defensive of slave owners? I believe she is referring to slavery apologists. My two older children (adults now) went through the Spotsylvania school district and studied much about the Civil War, especially the events that took place here in Spotsy and Fredericksburg. I recall that they studied little about slavery. My two youngest children who are passing through the same schools have had much more of a focus on slavery. They also spend just as much time on Frederick Douglass as they do on Grant and Lee. This shows how school curriculum has evolved over time. The only problem I have is that they tend to think along the lines of the “good guys” vs. “bad guys” which is a major over simplification. As one who has written multiple books from the Southern perspective, two sanctioned by the NPS, I try to present a balance. I often think about the children who do not have a historian for a parent and have a limited understanding of the complexities of the Confederacy’s ultimate contradiction over independence. I may be expecting too much at that age.